However... did the jumpgate's destruction also take out the beacon? This might make it difficult to navigate to the location. Good point.The beacon should be a part of the jumpgate and without it it wouldn't be possible for them to go there except maybe if they use some First Ones technology(a White Star or something else). Last edited by Truth_Seeker; April 26th 08 at 13:41. Well I'm only guessing, but I see the beacon system as being very similar to our road signs.Some tell you where you are going and which turn to take to navigate to a certain area of space, others tell you you have arrived at the system you want to go to. It must work something like that because we know that there has to be something spaced out communicating with a network (they rigged a similar system with starfuries, to rescue the Cortez). 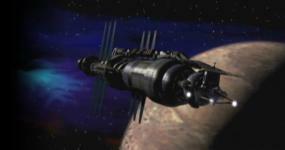 So with this in mind... with the Markab beacon gone, you'd probably still be able to approximate the system's location from the remaining beacons... but tech stealers without access to an expensive ship with jump engines of it's own... wouldn't be able to do their grave robbing so easily. I do feel sorry for Sheridan and Delenn at this point - leading the Alliance is a nightmare. As always, it's pure fun to hear the Londo/G'Kar dialogues. Their bickering is so delightful! It's also fun to see G'Kar's dismayed reaction over his status as a religious icon. Ah, and it's nice to see Ta'Lon again. I suppose you could chalk Sheridan's rather negative reaction to Franklin's promotion up to the stress he's under and to the feeling of isolation that losing another friend would mean. It's a nice touch to have Dr. Kyle named as his predecessor instead of some nameless character. The general feeling of the episode is rather depressing, but still, it's a good one. I don't have much to say about this one ... Again, I find it hard to watch the Garibaldi relapsing scenes, especially here, where everything goes disastrously wrong all around him. I agree that the Imperial Guard button seems like flimsy evidence, especially since it comes just after all this other planted evidence, but I suppose that combined with the knowledge that there is a leak up high, one could reasonably conclude that it is indeed probably the Centauri who are responsible. Best to keep Londo out of the loop while they investigate further. G'Kar as a religious icon is pretty entertaining, and I always enjoy seeing Ta'Lon. Maybe they did - it was back on Earth, after all. Any interview with Franklin would have been via BabCom. And the person leaving is Dr. Kyle, who'd been Franklin's predecessor on the Station. I'm sure his recommendation meant a lot. When it comes to Xenobiology, it would be hard to find anybody more qualified than Franklin, that's for sure. Plus we know from when Franklin arrived in "Soul Hunter" that he was already acquainted with Kyle. I wouldn't be surprised if they'd consulted with each other from time to time. It is indeed entirely possible that all the interviewing and stuff took place "off camera", and that Dr. Franklin has been thinking about this for a long long time, without it being mentioned on the show. It also seems quite plausible that he would get the job if he applied for it, as he seems to have the right qualifications. It's just the way it was phrased that I took issue with "He asked me to take over for him" makes it sound like Dr. Kyle singlehandedly took care of arranging for his own replacement. A retiring person isn't typically on the search committee that seeks to fill their position .. not here and now, anyway. Maybe in the B5 universe that's a common thing. You could also easily assume that by "he asked me to take over for him", what Dr. Franklin really means is that Dr. Kyle called him a while back to tell him he was retiring and to encourage him to apply for the position, but all that detail didn't fit into the script so well Yea, I'm just being overly nitpick-ey. I suppose you could chalk Sheridan's rather negative reaction to Franklin's promotion up to the stress he's under and to the feeling of isolation that losing another friend would mean.